At some stage in your real estate investment career you’ll need the services of a private lender. It’s pretty much inevitable, especially if your portfolio consists of multiple non-owner occupied residential properties or your portfolio is just starting and you intend to begin adding real estate over the next several months. 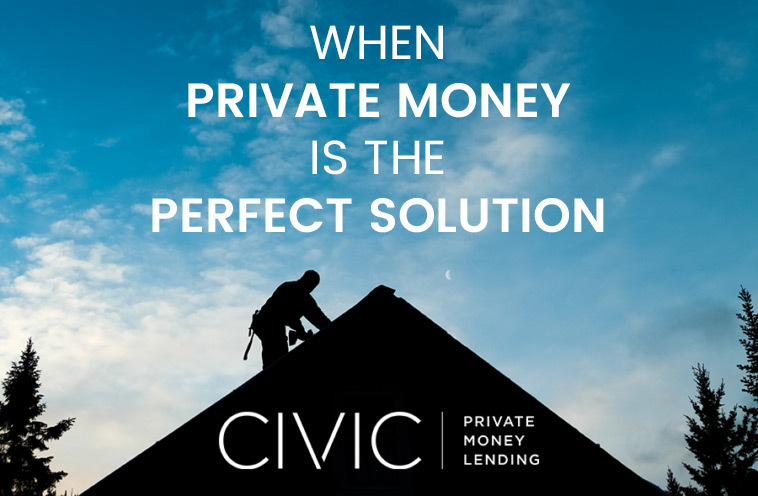 At Civic Financial Services, we’re here to help when private loans are the answer. But how do real estate investors in Honolulu know when a deal needs private money? Private loans are not considered a long term solution but rather a tool used to facilitate the purchase of investment real estate quickly and seamlessly while permanent financing is being arranged. Here are some signs that tell you private money is the perfect solution. When speed is of the essence, you need a private loan. While your long term financing solution is a conventional loan, a private loan is used when you need to close as quickly as possible. We can provide an answer much quicker than a traditional bank can as well as funding your project in record time. Here at CIVIC, our team of underwriters evaluates a loan application using our own internal guidelines without having to check with third party approval requirements. Loan applications are approved in-house without the need to send the loan out to other lenders for an approval. As a direct lender, we can process your loan in days, not weeks. Private money can also step in when a potential purchase is not quite ready for prime time. Banks and traditional mortgage companies are required to approve loans using established standards both for the borrower and the property being financed. As it relates to the property, the real estate must be considered “habitable” and in good condition. Most real estate investors are constantly on the lookout for real estate that needs some stage or rehabilitation. Traditional, long term financing means the property must be in good shape without the need for any repairs. For example, a property in Honolulu shows obvious signs of a leaking roof with water spots on the ceiling throughout the home while some spots clearly show water has entered the structure. A conventional loan won’t finance this example. A private loan however can. A private loan can be taken out to both acquire the property as well as borrow the necessary funds needed to fully rehab the unit and get the property in shape for permanent financing. If you’re still not sure if private lending is the perfect solution, all that may be needed is a quick phone call to us. We can review the project with you over the phone or you can email the scenario to us. Provide us a narrative about the project such as acquisition price, cost of rehabilitation funds, how long the work will take and what you feel the property will be worth once the project is finished. And finally, let us know your exit strategy. If you’re going to keep the property long term and take out a permanent loan and lease it or if you’re going to put it up for sale. Once we have this basic information, we can point you in the right direction and provide the ideal solution.